Home » Career and Income » Career Building » Are You Pursuing an Overcrowded Career Field? When it comes to a career, knowing what you want to do is half the battle. The other half is actually finding a job in your chosen field. In some job markets, an influx of eager candidates has rendered certain fields completely overcrowded with qualified workers. If you're ready to earn a degree or certification and pursue a set career path, you may want to do some research first. Ensuring that you'll actually be able to find a job in your desired field can prevent you from feeling like you "wasted" the time and expense of your education or training. 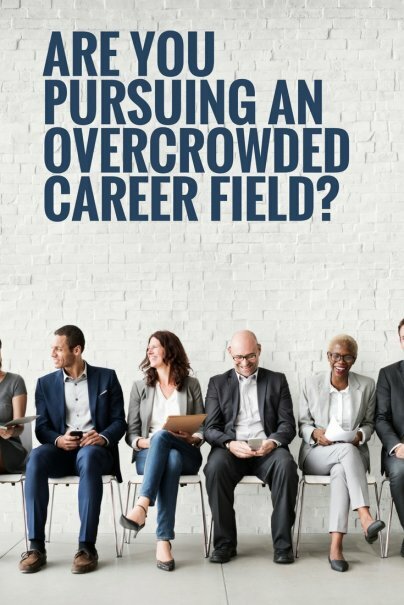 Here's how to discover if you might be pursuing an overcrowded career field. The U.S. Bureau of Labor Statistics compiles an Occupational Outlook Handbook that lists the projected outlook and employment changes for specific jobs over a 10-year period. If the projected growth of jobs in your desired field is low or nonexistent, you might want to pursue another career. Some job markets are more saturated in certain areas than others. If you're looking for more localized information, each state has a department of labor that collects state level stats about career prospects. The Idaho Department of Labor, for example, created a Jobscape Career Search Tool that allows citizens to check out the demand for specific jobs each year. The stats can be filtered by region using a ZIP code or city name. That can really help residents get a sense of job prospects. Here is a resource for finding each individual state's labor statistics site. When stats are projected over a longer period, it can be difficult to determine if the major growth has already happened. You may want to find stats that project shorter term growth (typically over a two-year period) for the occupation. Projections Central is a solid place to start. It lists short-term projections of occupations by state. If the change in employment prospects is either negative or low, it might be a sign to move or pursue a different career. Another way to get a feel for a crowded career field is to browse common job listing sites and see what the current listings are. If there doesn't seem to be a lot of job openings for your chosen profession on a local, state, or national level, the career field might be overcrowded. If there are tons of jobs available, you might be safe. Continue to keep an eye on the job listings as you prepare to enroll in a college or certificate program. If anything changes or doesn't change, it could give you some valuable insight on the state of the job market. If job listings for the career never seem to crop up, that's a very bad sign. If the same job listings remain month after month, that can be a good sign that companies are struggling to find candidates. Note this method is far more useful for careers with shorter educational requirements. The state of the job market today won't necessarily tell you what it will be like a few years down the line for careers requiring advanced degrees. Students can seek career advice from on-campus resources. A college career adviser, depending on the school and the individual's experience, can be a valuable source of information. If the adviser isn't any help on career-specific questions, students can stop by the career services office. The professionals employed in career services may be slightly better equipped to help you determine if your first career choice is a lucrative one. If they don't have specific information about your intended job prospects, they can at least help point you in the right direction to find the information you need. Networking can be helpful in determining if a specific degree is lucrative or not. Ask around to see if any family or friends might know someone who pursued the same degree or job field in the past. If you find someone, politely ask if they'd be willing to meet up and answer some of your questions. Consider asking how easy it was for them to find a job, what the competition was like, and if they've seen an influx of new graduates suddenly flood their market. If you need ideas for alternate career paths, many state government websites list the hottest jobs in their state for individuals to pursue. Indiana, for example, has a Hot 50 Jobs list. If your heart is still set on pursuing a career in a crowded field, take steps to ensure that you can outshine every other recent graduate during your job search. It may also be worthwhile to research which regions and states offer a more lucrative job market in that specific field. And as a final note, remember that different states have different certificate and education requirements to work in certain jobs. Make sure when you pursue an education that you will meet those requirements.